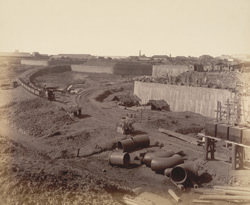 B - View from N.-E. corner forming with A [print 31] a complete panoramic view from N.-E. [Victoria Dock construction, Bombay]. bl.uk > Online Gallery Home	> Online exhibitions	> Asia, Pacific and Africa Collections	> B - View from N.-E. corner forming with A [print 31] a complete panoramic view from N.-E. [Victoria Dock construction, Bombay]. The idea for the construction of a wet docks for the use of shipping in Bombay harbour was first suggested by M. Malet when member of Council in 1855. In 1866, Russell Aitken, Executive Engineer to the Municipality prepared the foundation of a Harbour and Dock Trust which could raise money for the construction of wet docks on the Elphinstone and Mody Bay reclamations as private companies had gone into a recession. In 1875, the first stone was laid in the hope that the new dock would create a prosperous revolution in the trade of Bombay. In April 1879, the Prince's Dock was thrown open by the Governor of Bombay, Sir Richard Temple. In 1884, it was decided to extend the dock and construction then began on the Victoria Dock.